Iyengar yoga is a form of Hatha yoga that is suitable for all ages and all levels of fitness. My exploration of yoga began some years ago out of curiosity, and a hope that it could support me in feeling healthier, while giving me a space to pursue my interest in spirituality. The journey I embarked on back then has exceeded those expectations so many times over. I continue to be awed by the potential of yoga to simultaneously transform every aspect of life and the Self. I feel so inspired by the power of yoga to heal the body and the psyche, and to enable us to release trauma and negative energy from our physical and energetic bodies. My personal practice has previously supported me in recovering from a herniated disc and managing chronic digestive issues, as well as developing greater resilience and an increased capacity to surrender in the face of the ups and downs of life. My experience has taught me how, beyond this, yoga enables us to nurture self-awareness, awaken to our higher selves, and to discover our connection to the Earth and each other. I felt especially inspired to teach after discovering Kundalini Yoga several years ago. After only one session, I was hooked! I felt so intensely moved by the practice, and by its unique capacity to elevate the consciousness so quickly and through practices that are accessible to everyone. In 2013, I travelled first to India to undertake Hatha Yoga teacher training, and I completed my Kundalini Yoga teacher training in Arizona later that same year. I am currently undertaking training to become a conscious connected breath facilitator, and hope to soon be able to offer this alongside and in combination with yoga. As with Kundalini, I feel excited by how such a simple and accessible practice can create such profound experiences and such deep healing. In a yoga class, I love to work with mantra, breath work, meditation and mindfulness, as well as asana and movement – drawing benefit from the many tools that yoga offers us on our path towards growth and discovery. I aspire to create space for others to experience their own personal journey of healing and transformation. Suitable for all, short and sweet to sparkle your day! Join Andrew and Francesca at www.pureyogacheshire.co.uk where we will delight you with a Yin/Yang inspired class to delight your Wednesday. The class will start with warm up movements, moving onto standing postures and it will finish with sitting postures and short relaxation. A 45 minutes treat to leave you refreshed, recharged and balanced. Suitable for all, even those with limited experience. Pay £7 ONLY at the door (cash only please). Included in your class pass. Every Wednesday from 3rd of April from 12.15 am to 1 pm. I was born in Italy, and after moving to London in my early 20’s I lived in several countries – including Egypt, Canary Islands and Ireland – before moving to Cheshire (England) in May 2012. I’m a British Wheel of Yoga trained Teacher with influences from classical and more contemporary Hatha Yoga traditions. I share my practice as a fusion of breath coordinated movements and classical postures which promote strength, flexibility and balance, culminating in a practice adaptable to all abilities. Yin Yoga and Meditation is on Friday from 5.30 to 6.45 pm – No need to book. Also try our Yin/Yang practice on Tuesday from 7.30 to 9 pm for a delightful strong and still, balanced practice. Yin Yoga allows us to ground and to slow down, balancing our busy lifestyle. You will be holding certain sitting postures for a little longer than usual and this will benefit your joints and your inner body. A delightful and calming yoga practice, suitable for all. The name “Yin Yoga” refers to a passive practice, where the muscles are not really involved (unlike other traditional forms of yoga). We act on the bones and joints with sitting postures that target the connective tissues of the hips, thighs and lower spinal area. Allowing gentle pressure on bones and joints maintains the health and the longevity of those areas, whilst creating a deep sense of “coming back” to yourself. Yin postures also act on the energy meridian of the body, refreshing and toning up the digestive, excretory, circulatory and respiratory systems. This practice encourages the releasing and letting go and will stimulate a physical, energetic, mental and emotional flexibility. It’s the ideal practice to ground ourselves, physically mentally and emotionally. Meditation will follow more effortlessly and it will be enhanced by the effect of our physical practice. All our classes are drop in. You can pay at the door £9 (cash) or join our convenient and flexible class passes – more information here. I started practicing yoga in the 90s whilst living in Brighton. I was fortunate to work close to a studio called ‘Natural Bodies’ and was able to attend Scaravelli Yoga classes with Gary Carter and Jo Avison regularly. A dynamic flowing style of yoga that harmonizes breath & movement, to give strength, grace and freedom. Our classes encourage the body awareness needed for a correct alignment in the Asana practice. This is an effective way to prevent injuries, to improve body performance and to maintain the health and longevity of the body. Vinyasa Flow yoga is suitable for everybody – and especially for those who have practiced a little bit of yoga already. For those who are not very used to a physical practice this Yoga class is a fun introduction to develop body awareness and gradually increase fitness level; for those who are already practicing a fair amount of physical activity, it is a wonderful way to balance and develop strength and flexibility. In the Vinyasa Flow Yoga classes we also introduce different themes based on principles of alignment. Individual attention is always given and the fairly strong physical nature of the class is balanced with time for sitting still and to connect with the breath, inviting inner awareness. Everybody is invited to practice at their own level, and progressively we introduce more engaging postures and sequences, according to one’s strength and flexibility. No need to book, just arrive few minutes before the class and fill a registration on your first class at the studio. Hazel Littlemore Young is passionate about yoga, and the profound effects it creates for physical and emotional wellbeing. Her focus is on a healthy, happy yoga practice for all students. Trained in Vinyasa Flow by the renowned Claire Missingham, Hazel is very enthusiastic about delivering engaging, exciting classes. Expect an uplifting practice, filled with strong, flowing sequences, linking movement to breath. Using asana, pranayama and meditation, her classes aim to create a yoga experience that ties together mind, body, and spirit. “My first brush with yoga was as a child, when I stumbled across my mum’s ‘70s yoga book filled with shiny leotards and strange-looking poses. I was fascinated… but like the ’70s fashions it featured, it got tucked away and forgotten, until my 20s when I wanted to improve my fitness. I turned to yoga primarily because I thought it would be easier than going to the gym! I was totally unprepared for how transforming yoga could be. Now, yoga is a lifestyle and discipline for me – meaning that when I’m not teaching, I can usually be found reading, researching and learning about yoga, or on the mat – deepening my own practice with a variety of yoga styles and teachers, keeping my teaching relevant, fresh and thoughtful. Pregnancy yoga is on Wednesday from 7 to 8.30 pm – Ongoing class, you can join us anytime! Prenatal yoga that is intimate, friendly, joyful and supportive for your body/mind/spirit during the most special time in your life. We provide a safe and nurturing environment, helping you to connect with your changing body and to feel calm and grounded. 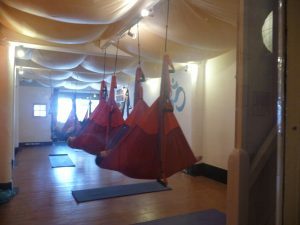 All equipment (yoga bolsters, blankets, chairs, cushions, blocks etc…) is provided in our beautiful dedicated Yoga Studio. help the expectant mother to bond with the unborn baby through breathing and visualisation techniques. Open to all level of pregnancy. Francesca is a qualified Pregnancy Yoga teacher, she trained with Yoga Campus in 2012 with renowned teacher Uma Dinsmore-Tuli. Cost for Pregnancy Yoga: £45 (cash or cheque only please – no card payment facility at the studio) for 6 classes to be taken within 8 weeks. Drop in rate once you have passed your 33rd week: £9 per session. Dru Yoga suitable for all, including beginners and the over 50’s, is on Tuesday and Thursday morning from 10 to 11.30 am – one and half hour to enjoy a longer relaxation! Dru yoga can be practised by people of all fitness levels and abilities (including those with arthritic or rheumatic joints or joint replacements). The use of modifications and visualisation means everyone can experience the benefits of this gentle, yet dynamic approach to yoga. It is an empowering, holistic and balancing approach to health, vitality and well being. Dru yoga is unique in its use of Energy Block Release Sequences, which are easily practiced flowing yoga movements that help to release tension – physically, mentally and emotionally. Joints are kept relaxed and soft during movements (as in Tai Chi), creating flexibility and free flow of subtle energy. No need to book, arrive at the studio few minutes before the class and fill a registration form. Yoga keeps me calm, balanced and happy, it completes my day. Although I had attended various yoga classes throughout my life I had not attended one for several years. After years of bouts of clinical depression I started to attend a Dru yoga class and soon felt the benefits not only physically, but on a deeper emotional level. After attending several workshops and retreats I felt drawn to learning more and applied to undertake my teacher training as my own personal journey. As I learnt more, this changed to a feeling of wanting to share this yoga with others. I have been teaching a class for Activity in Retirement for 3 years and taught for Age UK for 1 year. I also completed my teacher training in meditation. I attend Pure Yoga classes and workshops as Yoga for me is a continuous journey, every class or workshop you attend deepens your knowledge and personal practice bringing you back to the still point within.